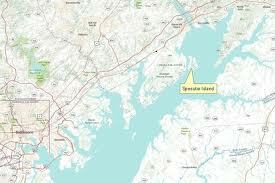 Spesutie Island is a 1,500-acre (610 ha) island located in the Chesapeake Bay in Harford County, Maryland, 5.5 miles (8.9 km) southeast of Aberdeen. Spesutie Narrows bounds the island on the west and the bay bounds it on the north, east, and south. The island is part of Aberdeen Proving Ground. Before its discovery by the early settlers of this area, the Susquehannock Indians hunted bear on Spesutie Island. There are arrowheads and other evidence of small camps, but they left no archeological evidence of ever having a permanent settlement there. The island's name, oddly enough, is not of indian origin, but is derived from the Latin word for hope, spes, and the first owners name, Utie. This island was given to a Nathaniel Utie in a 1658 land grant, by Lord Baltimore. Nathaniel Utie (also spelled as Utye) was born in Jamestown in 1635, and had come to Maryland with a group of Puritans who were exiled from Virginia in 1649. Utie and the other Puritans settled at Providence, just outside modern-day Annapolis. This was no rag-tag troupe of refugees: practically every one of the men in this exiled group was wealthy, powerful, and had connections in England, and several of them went on to become quite prominent. When Lord Baltimore started handing out land grants, Utie ended up being the largest landholder in what was then Baltimore County. His newfound status came with responsibilities. He was instructed to inform the Dutch, whose settlements along the northeast Atlantic coast extended south into Delaware, that Lord Baltimore had decided many of their colonies were now in Maryland. The Dutch were NOT completely delighted to turnover all their holdings to Lord Baltimore. They launched into a series of conflicts over two decades that were called the Anglo-Dutch Wars, and most importantly for the purposes of this story: many of the Dutch settlers came to despise Nathaniel Utie. Many Dutch colonial representatives complained at length about his highhandedness. Evidently, he marched into the Dutch colony of New Amstel and informed everyone that they were now in Maryland, and that they had three weeks to either get out or declare allegiance to Lord Baltimore. He actually managed to persuade fifty families to defect to Maryland, and even seduced seven Dutch soldiers away from New Amstel. He was variously described as mutinous, seditious, violent, boisterous, stormy, blustering, irritating, and frivolous. When Utie received the grant for the little island in the Chesapeake, he called it Spes-Utie, which combines the Latin spes, meaning hope, with his own surname, which basically means he called the island "Utie's Hope." Utie thought the name would encourage settlers to stay on his lands. The island was also known as "Spesutia." 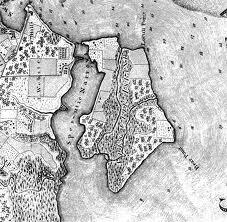 Utie brought settlers to the Upper Chesapeake, and built a house on the island called Spesutia Manor. At some point, he married a woman named Mary Mapletoft Ward, who was the widow of one of Utie's settlers. Mary Mapletoft Ward Utie died in 1665 - she was stabbed to death. According to Maryland court records, Mary was stabbed repeatedly in the upper arm on September 30th, 1665 and died five days later on October 4th, at Spesutia Manor. According to her husband, the stabbing was done by one of their slaves, a man named Jacob. Jacob, with only the slenderest pretense of a trial, was condemned to be drawn and hanged, and this sentence was carried out in St. Mary's City a few months later. Slavery had just been legalized in Maryland in 1664. As a slave owner, Utie was in possession of several potential murder suspects who were legally considered subhuman and could not defend themselves against any allegations he might make against them. He had no neighbors, and if one of his other slaves should happen to witness anything, they couldn't testify against him in court. In early 1666, Nathaniel Utie remarried, this time to Elizabeth Carter, the daughter of John Carter of Virginia. Elizabeth received 1/3 of her father's estate as a wedding gift, and according to John Carter's will, she would inherit the whole shebang if her brothers should die without sons. It was a very advantageous match for Utie, and it is thought Utie had arranged for the murder of his wife. Mary Utie was buried in a family plot near Spesutia Manor, since the first church to be established near Spesutie Island wasn't built until 1671. Nathaniel Utie died in 1675. The property remained in the Utie family until 1779 when Samuel Hughes purchased it. In 1802, William Smith bought the island, and his descendants would remain there for almost a century, though the War of 1812 brought some disruption. In late April 1813, troops under the command of Rear Admiral George Cockburn briefly occupied the island, and passing vessels such as HMS Highflyer engaged in the forced purchase of cattle. Throughout the 1800s Spesutie Island was mostly rich, fertile farmland. The island’s character changed dramatically with the onset of World War I. The surrounding mainland properties were purchased by the federal government to establish a gun range for testing artillery ordnance. In the absence of productive farm land nearby, several corn and tomato canneries on the island that depended on vegetables from these properties, were forced to close. The Smith family sold the island in 1900 and by 1927 ownership had passed to the Susquehanna Development Company. In 1936, J. P. Morgan, Jr. built a house on the island to use as a hunting lodge. The Spesutie Island Hunting and Fishing Club was maintained on Spesutie until the island sold in 1945. The purchaser was Uncle Sam. The fertile farms and hunting preserve, for which the island was well known, were replaced by a large air-to-ground rocket range and a fuse-testing and bomb-disposal areas. The Island is off-limits to general public.